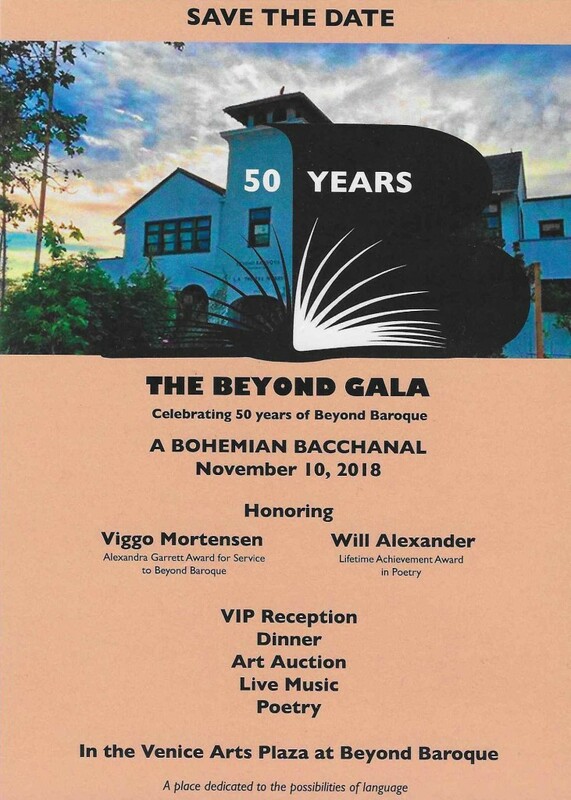 Around a dozen years ago, I told the artistic director of Beyond Baroque that the institution needed to do something to celebrate its upcoming 40th anniversary. I had returned to Los Angeles County in 2006 to take up my teaching post at CSU Long Beach, and was happy that Beyond Baroque was still managing to survive. In the five year stretch between 2003 and 2008, for instance, there would have been little point to anniversary party. The place was barely keeping its doors open. Twice during that period I arrived at 681 Venice Blvd. on the last day a grant application was due, and worked until midnight to help Fred Dewey get the grant to the post office in time. Twice, we arrived at the post office to get in line for the postmark with less than ten minutes to spare. I was hardly the only one that had to endure demands from its artistic director for assistance made necessary by his improvised planning, but I remember the second time as being especially exasperating. I had told him the first time, “Don’t ever do this to me again.” And of course, he did. Needless to say, there was no special observance of Beyond Baroque’s 40th anniversary, but the place did manage to hobble along until Richard Modiano took over in this decade, and things began to improve; Beyond Baroque is now poised to take a much deserved bow as one of the most deserving cultural resources of Los Angeles. The premiere screening of Peter Fitzgerald Adams’ documentary about George Drury Smith. It also includes a discussion of Beyond Baroque’s early days moderated by Richard, and featuring George, Exene Cervenka and Jim Krusoe. Friday, November 16 – Beyond Baroque Proclamation Day at Los Angeles City Hall. An official proclamation honoring Beyond Baroque will be made at the Los Angeles City Hall on Friday, November 16. The proclamation will be made at 11 am. Anne and Will will read together in celebration of his lifetime achievement award. They’ll be joined by Janice Lee and Justin Desmangles. Nov.17 – 4:30 pm – Beyond Baroque in Retrospect. Bill Mohr and Laurel Ann Bogen will be joined by Amy Gerstler, Dennis Phillips, Suzanne Lummis, and S.A. Griffin. They’ll discuss they’ll read from the work of some of the key poets – including their own – to make Beyond Baroque their home over the years. It will be followed by a potluck. The second edition of the New Series. Three poets read work that Beyond Barqoue commissioned specially for the festival. Larry Smith has just written and said that the 25th issue of his on-line edition of CALIBAN magazine is now up and available for your reading. I am very honored to to have a new poem, “The Transversal,” published in this issue, along with the work of several comrades who have been writing poems for many, many decades.